Roseau, Dominica – January 1, 2008………………..Not even intermittent showers were enough to stop hundreds of Dominicans from converging on the Dame Eugenia Charles Boulevard in Roseau from 3 am on January 1, 2008 for Reunion Wivé- an activity full of symbolism, heralding the start of a year long programme of activities in commemoration of Dominica’s 30th Anniversary of Independence. The Eugenia Charles Boulevard was impressively decorated with arches as well as representations and illustrations of Dominican and Caribbean life and culture. 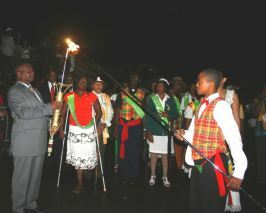 The highlight of Reunion Wivé was the arrival of the Reunion Torch on a Kalinago Flotilla of canoes after which the Carib Chief of Dominica, Mr. Charles Williams symbolically handed over the Torch to the Prime Minister of Dominica, Hon. 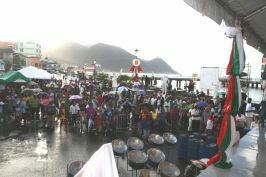 Roosevelt Skerrit in full view of the hundreds gathered to witness this historic event. The Reunion Torch then changed hands ten times to individuals representing various segments of the Dominican population to include an elder, a politician, a disabled person, a sports personality, the President, a Kalinago child among others. The lighting of the permanent reunion flame on the site of the old fountain on the Boulevard by a Kalinago boy was a poignant moment that will undoubtedly go down in the annals of Dominican history. The lighting was followed by an impressive fireworks display as the Capital City, Roseau came alight. The Praise and Worship segment included participation from the Bishop of Roseau, the Association of Evangelical Churches, the Muslim and Rastafarian Communities among others. Addresses were delivered by the Prime Minister, Hon. Roosevelt Skerrit, Minister for Community Development, Gender Affairs, Culture and Information, Hon. Loreen Bannis-Roberts, Carib Chief, Mr. Charles Williams and Chairman of the Reunion Committee, Mr. Hubert Charles. Other dignitaries included the President of Dominica, His Excellency, Dr. Nicholas Liverpool and Acting Chief Justice of the Eastern Caribbean Supreme Court, Sir. Brian Alleyne and Lady Alleyne. There were performances from the Kalinago people of Dominica, the Music Lovers Government Band, the Dubique Bele Group, the Judah Steel Orchestra and the Shaka dancers. The crowd was also treated to solo performances from Mikael Ferrol, veteran calypsonian, Jammer B and Dominica’s First Lady of Song, Mrs. Ophelia Marie. Following the conclusion of the official opening ceremony at just after 8am there were activities and performances throughout the day.